« Je Suis a Paris! There is a great little corner café just short walk from my apartment in the 11th arrondissment of Paris. Specializing in the legendary Absinth (a distilled, highly alcoholic 90-148 proof potion flavored with flowers and leaves of the Artemisia absinthium, or grand wormwood, green anise, sweet fennel, and other aromatic herbs- which I have not yet tried but have seen served with a sugar cube suspended over the glass on a spoon, soaked with the Asbinth, and then lit on fire so that the sugar flames and then melts into the glass), the Café La Fée Verte also serves quality food for a very reasonable price. I ordered the plate du jour for a mere 9.50 Euro (or about $12). Here the name says it all- a special dish of the day prepared with seasonal produce bought at market that morning (very different than the hometown Saturday Night Special prepared in order to get rid of the aging beef in the back!). 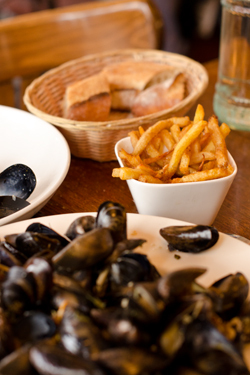 Today’s plate du jour was an amazing heaping bowl of mussels cooked in a white wine broth and served with pommes frites (French fries) and , of course, a healthy portion of French baguette (actual dish pictured below). I’ve had seafood in some very good restaurants in some very famous seaside cities, but they all pale in comparison to this Parisian delight. I was suddenly swimming in the ocean with traces of tangy salt tickling my taste buds, so fresh were these little black beauties. And I learned a valuable tip- save the bread to the very end so you can sop up all of the delicious juices, that nectar of the sea! But perhaps the best part of the meal was when my waitress, Alizée (meaning a tropical breeze she told me after realizing her English was far better than my still ripening French) taught me the local way to eat mussels. Since I was not given the Barbie size fork I am accustomed to receiving in America and Italy to pick out the meat, I was using, rather clumsily I might add, a full size fork to awkwardly dig for the prize. “Like this…” She smiled and took a shell from my discard bowl and demonstrated how to pinch it together and use it as a tool to extract the meat from another mussel. “It’s the French way!” she exclaimed over a smile. “It’s good to use your hands.” And so it was. There’s something to be said about finger food that leaves you licking your fingers and wanting more. Not bad for a $12 plate of the day- possibly the best seafood dish I’ve ever had, and with a free lesson in French culture thrown in gratis. 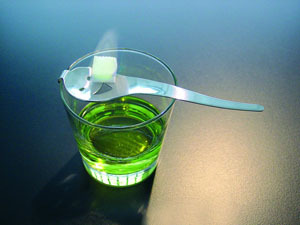 I’ve heard a bit about Absinth, but I’ve never had the pleasure. You’ll have to tell me more about it. What a cool story about your waitress and the mussel! I am so green with envy. Fresh food that really is fresh… what a concept!